This is a sponsored post written by me on behalf of the Chinet® brand for IZEA. All opinions are 100% mine. 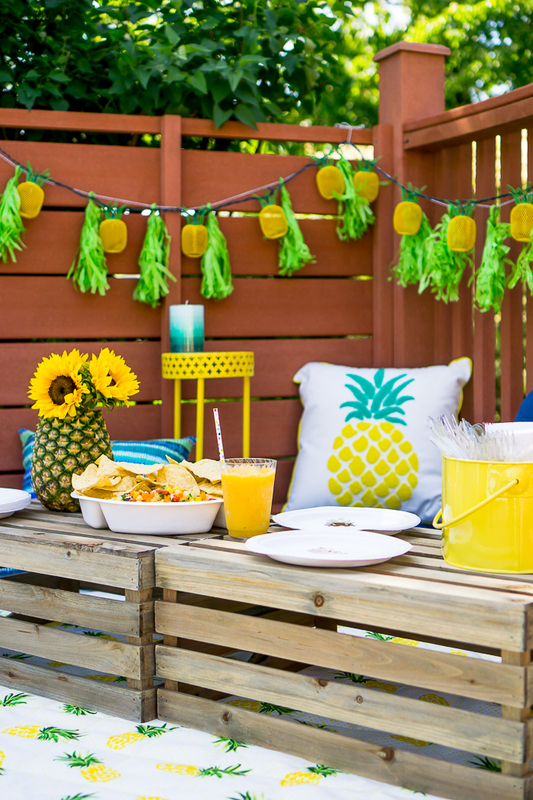 I’m sharing 8 Tips for Hosting the Ultimate Pineapple Pool Party! 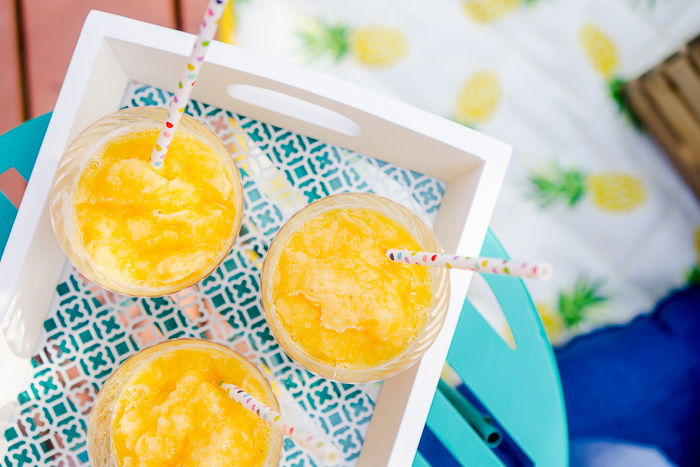 From decor and tips to a fun Tropical Slushy Cocktail Recipe the adults will love, I have you covered for your ultimate summer bash – pineapple style! 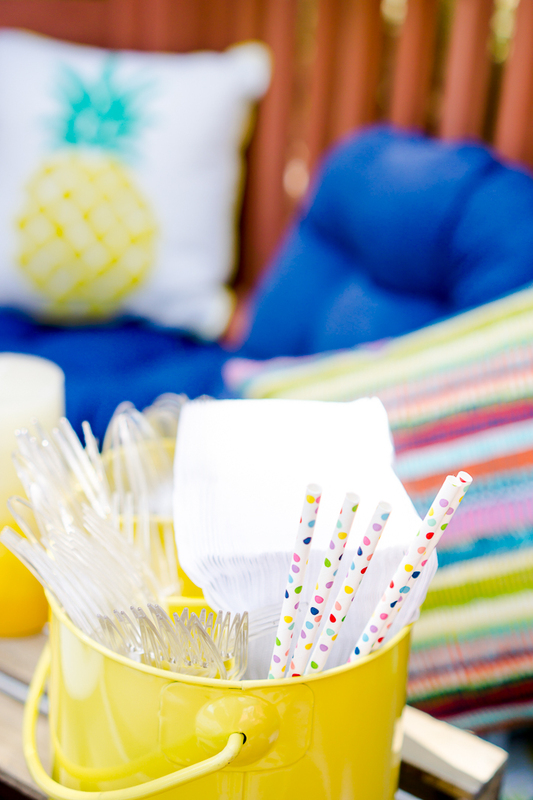 Easy Tips to Prepare You for a Summer’s Worth of Fabulous Pool Parties! Summer for my family means weekends in the pool! Holidays, birthdays, and even random get togethers are spent outside soaking in the sun rays and cooling off in the water. I’m a summer girl, so poolside is always the ideal way to spend my Saturday. However, a fun pool party can also lead to watery puddles inside if you don’t have a good space for the adults and kids to lounge outside with snacks and drinks, which is why I love a low table set up near water’s edge! 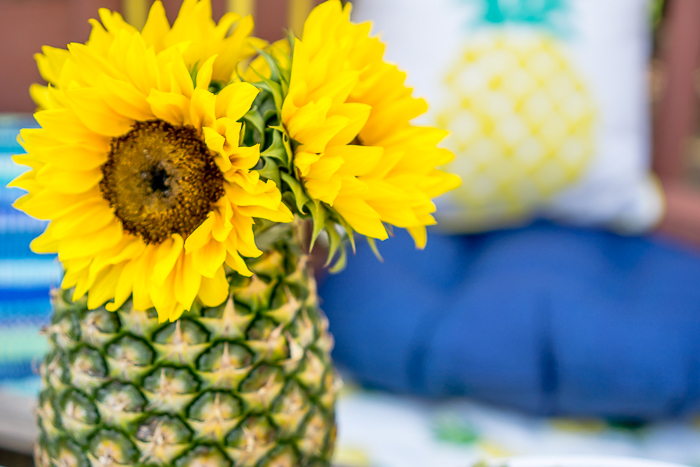 Here are my tips for setting up a fun Pineapple Poolside Party! I wouldn’t consider any deck to be particularly comfortable if you are sitting down for an extended period of time. Putting down a waterproof picnic blanket or beach towel will make the surface smoother to sit on. Then, add on lots of outdoor pillows to make a nice seat or back rest. This space works perfectly for taking a break with Liam and he can even lay down to drink his bottle or crawl around without hurting his knees on the hard, scratchy deck. When setting up a spot for rest poolside, I definitely look for the shadiest part of the deck. For us, it’s a corner that begins to get shade first at around 1 pm. I do this for two reasons: one, we all need a break from the sun sometimes and I would much rather take a rest in shade, and, two, it keeps the food and drinks fresher longer to not be directly in the sun baking away. If you don’t have a shaded area, consider getting a big umbrella or draping some fabric across the area to make some shade. If you are going to set up a fun poolside picnic area, then you also need to sit up something that can serve as a low table. 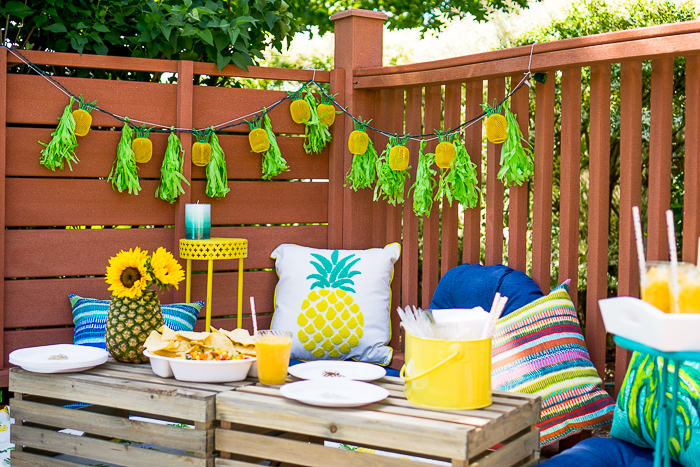 I used two big wood crates that worked perfectly for this Pineapple Pool Party. I wasn’t worried about them getting wet or damaged, and it fit the fun, casual decor look perfectly. Speaking of decor, you can easily set up this poolside party with no theme or decor, but it’s definitely more fun if you do! If you follow along with this blog, you know I am all about making moments a little more special, even the casual family Saturday. I decided to set up a Pineapple Pool Party which was perfect because I guess pineapples are the IT thing this summer. 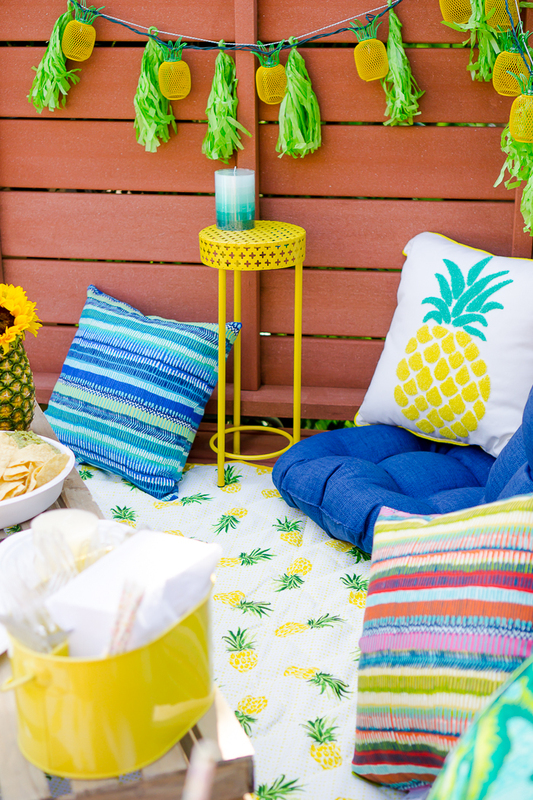 It was easy to find pineapple outdoor pillows, picnic blanket, banners and even lights! So many fun options to choose from. My favorite piece for this party is the pineapple vase! I had seen it done in a photo a few years ago and have wanted to attempt it ever since. After removing the core to make space for the flowers, I suggest adding a ziploc bag with water OR a ziploc bag with a wet floral sponge to keep the flowers fresh all day long. You wouldn’t want to go through all that effort just to have your flowers wilt in the heat. If you’re pool party is going to go late into the night like our’s usually do, then I suggest adding some soft lighting as well. I much prefer soft light at night than any big spotlight because it’s easier on the eyes and generally attracts less bugs. 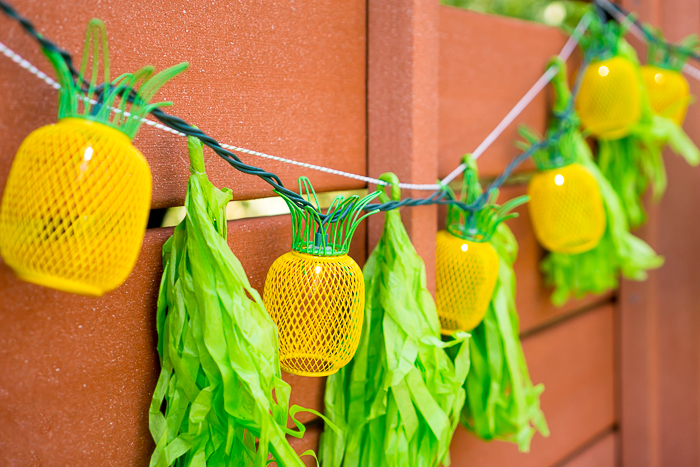 You can find so many cute strand lights these days like these pineapple lights as well as durable outdoor strands that you would leave out all summer long. I want entertaining to be easy which means we turn to the Chinet brand for our summer entertaining. With a wide range of products, they always have what I need! 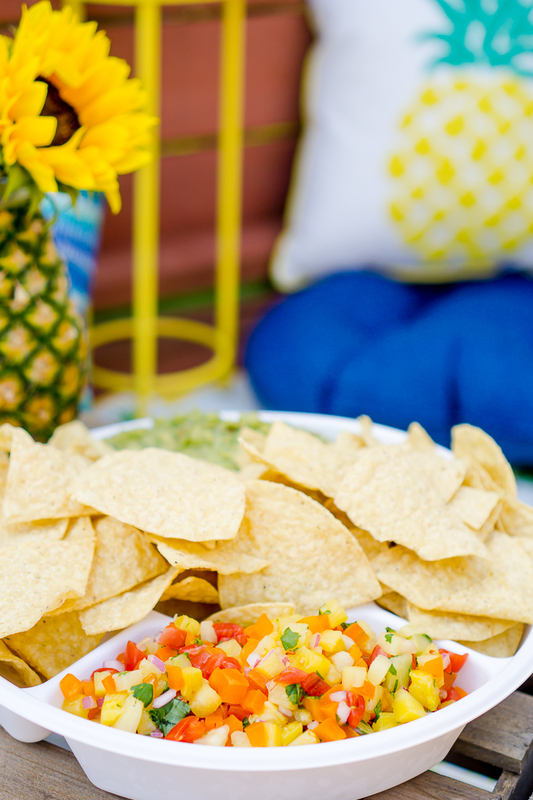 The Chinet Chip & Dip Party Tray is my new fave! Plus Chinet® Classic White™ products have premium strength so we won’t need to worry about spills or leaks. You can learn more here! At the end of the night, I don’t want to worry about a difficult clean up process so the Chinet Brand is a must for me because I’m given more time to socialize and enjoy the pool instead of spending that time cleaning We just throw away or recycle the pieces we used throughout the day. Chinet Classic White plates and platters are made from 100% pre-consumer recycled material that can even be composted after use. Plus, I love keeping the Classic White products around because they goes with everything! Make sure you find the products you want using the Find A Store feature and stock up for the whole summer! 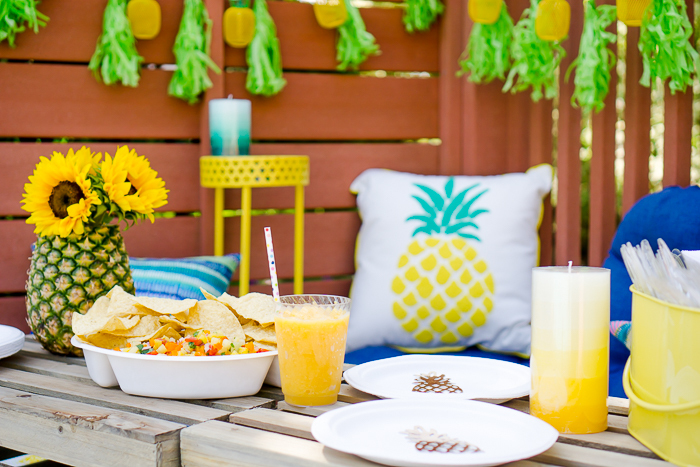 If I am going to throw a Pineapple Pool Party, of course, I am going to include some pineapple inspired recipes as well as summer classics. 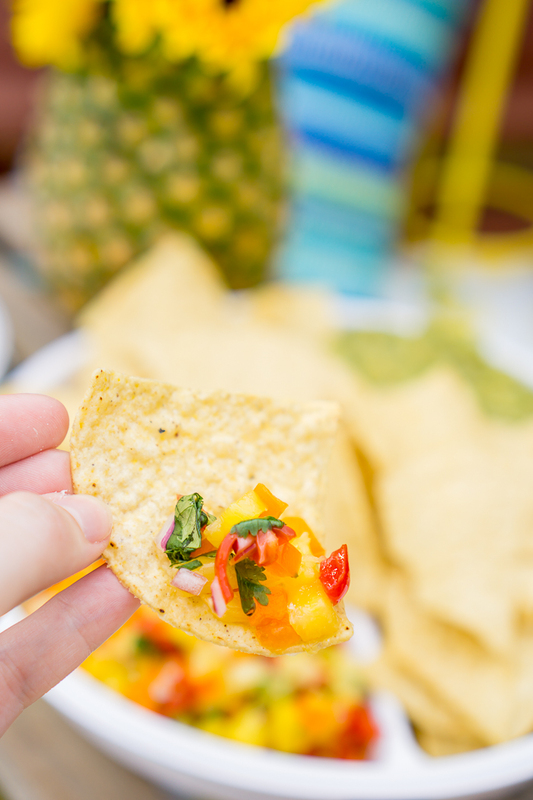 While I served up guacamole, I also quickly tossed together a Pineapple Salsa using pineapple, bell pepper, red onion, cilantro, and lime juice. It’s a great, fresh salsa for summer. They both fit well into the Chinet Chip & Dip Party Tray, which was so easy for clean up at the end of the night. 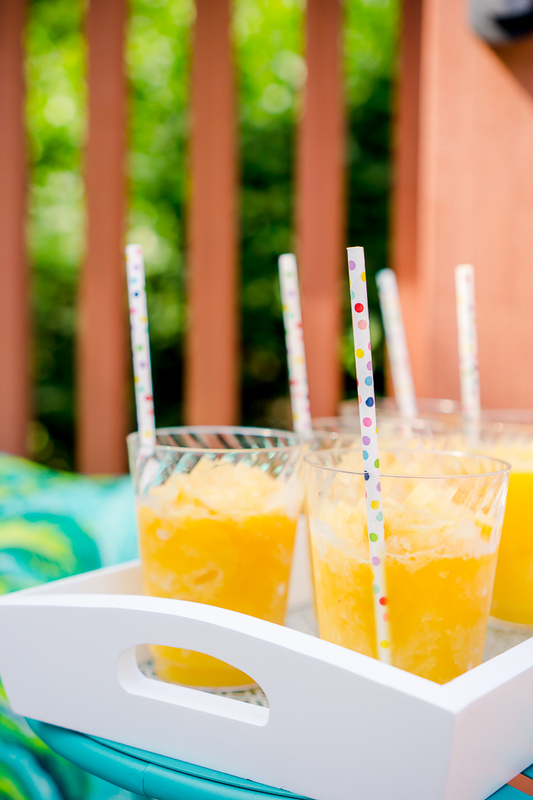 For drinks, I served up this Pineapple Orange Lemonade Slushy for the adults because who doesn’t want a fun Tropical Slushy Cocktail! This was a favorite drink of my mom’s though I think it’s more a summer drink when she used to make it for the holidays. I also quickly tossed together a Pineapple Salsa using pineapple, bell pepper, red onion, cilantro, and lime juice. Of course, you can’t forget the pool while setting up for the ultimate pool party! Make sure you have plenty of sunscreen and pool toys and rafts ready for your guests to enjoy. If you really want to go all out on a pineapple theme, purchase pineapple shaped pool rafts! I’m crushing over them, but my husband said we already had plenty of pool rafts!! Ready for a summer worth of pool parties and BBQs?! 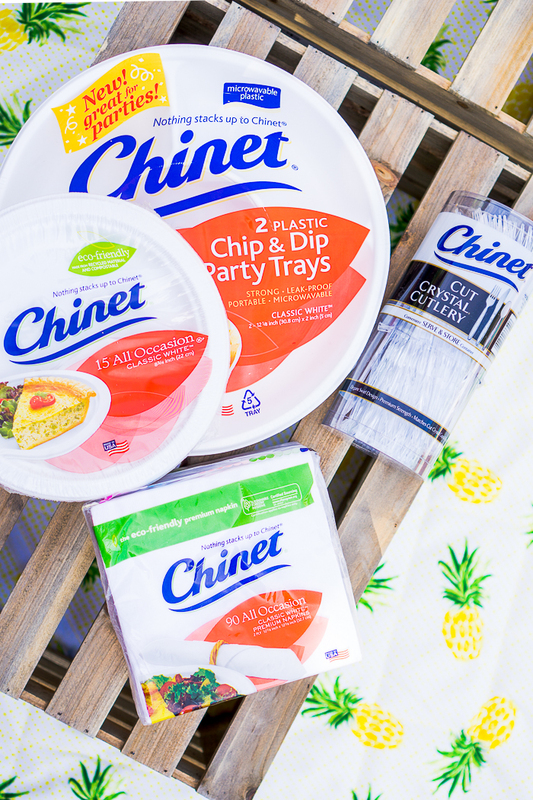 Go pick up some Chinet Classic White products and comfy pool party decor so you’re prepared to throw a fun Pineapple Pool Party next weekend!